A pretty gluten-free low carb birthday cake recipe with moist low carb cake and sugar free frosting. The cake is filled with sugar free raspberry jam and lemon whipped cream. Since it’s my birthday today, I wanted to celebrate with a pretty birthday cake. I actually made the cake yesterday and since I had all of the other recipes ready (the sugar-free raspberry jam and the sugar-free French buttercream frosting) I only had to concern myself with preparing and assembling the cake. I’ve made homemade birthday cakes for my family for over twenty years. It’s something I really enjoy. 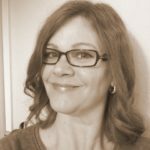 Eight years ago I started baking gluten-free low carb birthday cake recipes. They aren’t any harder to make than regular cakes and I enjoy them even more. Maybe you’ve seen the low carb chocolate birthday cake or the low carb peanut butter chocolate birthday cake I shared last year? They were fun. When I first began my low carb journey I wasn’t sure I would ever eat baked goods again, let alone sugar free cakes. That changed the moment I saw the beautiful cover photo of Elana Amsterdam’s cookbook, “The Almond Flour Cookbook”, which featured a chocolate almond flour cake. 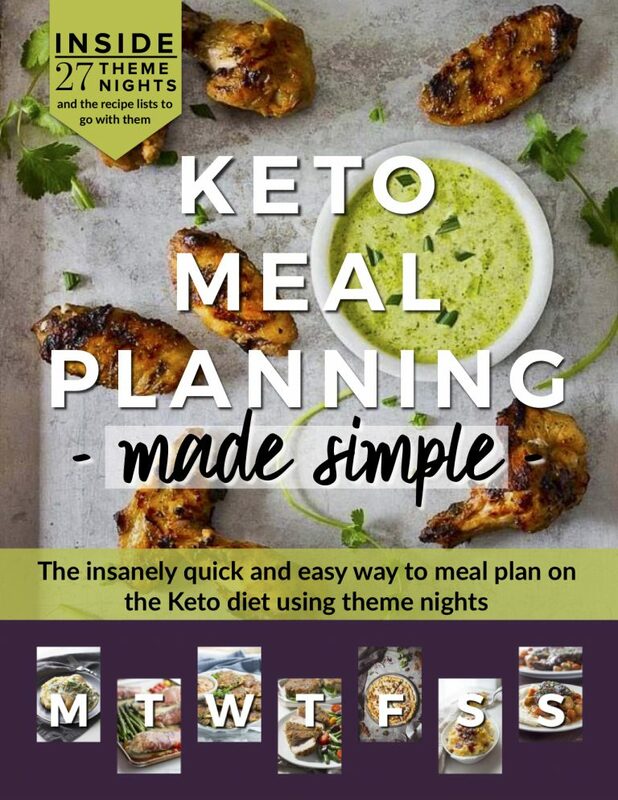 I knew then, that enjoying the occasional low carb keto treat would be possible. 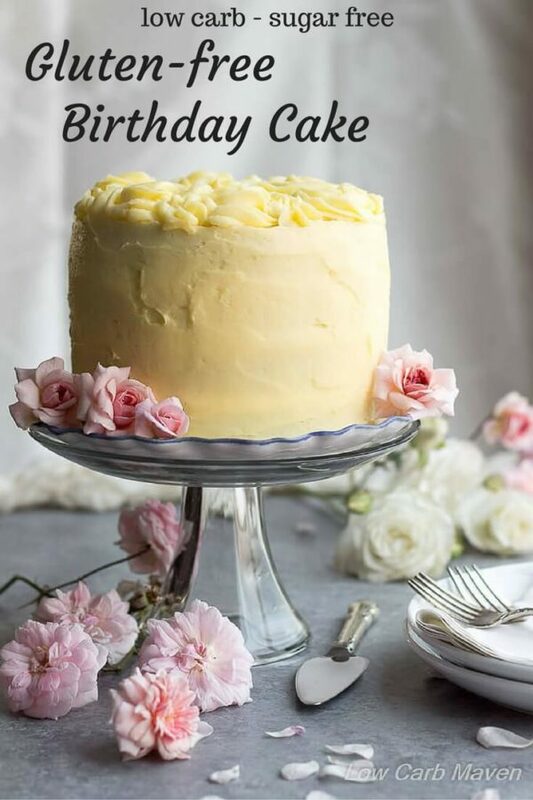 This is the first time I have shared a gluten-free low carb birthday cake recipe that was vanilla, although I do have a nice recipe for vanilla cupcakes. 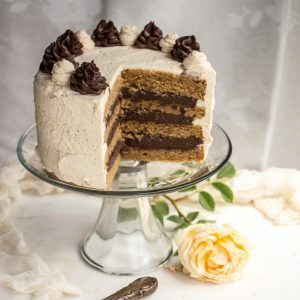 I usually post low carb chocolate cake recipes just because low carb vanilla cakes made with almond flour and coconut flour are so dark in color. There’s no way around it really. Of course, I could have used a cheaper butter (typically more pale in color) and egg whites instead of whole eggs, but I didn’t. Like my other birthday cake recipes, this is a study in how combining a few basic recipes results in something unique. 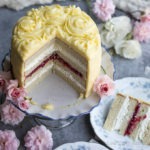 For another unique cake try the low carb sugar free coconut lemon curd cake (coming soon) – it’s perfect for spring. 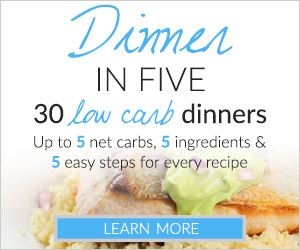 [ABOUT THE RECIPE] Low carb baking can be simple with few ingredients or a little more complex with more ingredients. 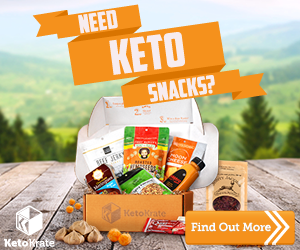 A few of us low carb bakers have found that combining several low carb ingredients results in the best possible texture – each ingredient has a purpose. It’s often the difference between a good recipe and a great recipe. HOW TO PIPE ROSETTES: Watch how to pipe roses from this video clip from Charm de Bon Bon. This pretty gluten-free low carb birthday cake recipe serves 12, at 4 net carbs per serving. A pretty gluten-free birthday cake recipe with moist low carb cake and sugar-free frosting. 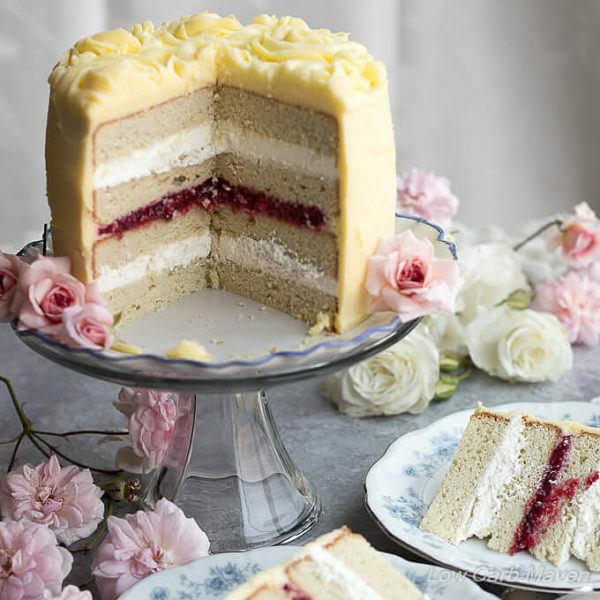 The cake is filled with sugar-raspberry jam and lemon whipped cream. 1.) Prepare the Sugar-free Raspberry Jelly the day before or up to a week before assembly. 2.) Prepare the Sugar Free French Buttercream Frosting the morning of or up to a week before assembly. 3.) Prepare the cake the day before or up to 5 days before assembly. Wrap well in cling wrap. Cake Preparation: Pre-heat oven to 350 degrees F and position rack to the lower third. Trace the bottoms of 6 X 2-inch cake pans on parchment and cut out the circles. Spray the pans with baking spray and line the bottoms with parchment. Measure the dry ingredients together in a small bowl and whisk to combine and break up any lumps. Add 1/3 of the dry ingredients and beat until fully incorporated and the batter is fluffy. Add 1 egg and 1/4 cup of buttermilk, beating until incorporated and until the batter is light and fluffy. Add 1/2 of the dry ingredients and beat as before, followed by 1 egg and 1/4 cup of buttermilk. The goal is to keep everything light and fluffy. Add the last of the dry ingredients, beating well, followed by the last of the wet ingredients, making sure to scrape down the sides and bottom of the bowl. Divide the cake batter evenly between the two pans. The batter will be very thick - like a cookie dough, and will need to be spread into the pan with a small offset spatula or knife. Lift a pan a few inches off of the counter and let it fall onto the counter. Do this twice for each pan to help knock out any larger air bubbles. Place the pans in the oven and turn the oven up to 400 for 8 minutes, then back down to 350 for 30 minutes or until the tops of the cakes are firm, but still springy to the touch. Remove the pans from the oven and let the cakes cool in the pans until cool enough to handle. Loosen the cakes by running a slender knife along the edge of the pan and turn out onto a cooling rack to cool completely. Wrap in cling film and refrigerate until needed. Assembly: Whip the French buttercream frosting and refrigerate. Whip the heavy cream with sweetener and lemon zest until soft peaks form. Add the xanthan gum and beat until very stiff. Carefully slice off the tops of the cakes to level the tops. Slice the cakes in half, horizontally and place one on the serving plate. Snip the corner off of a quart ziploc bag ( 1/2-inch up from the corner ) and insert a large round tip, if you don't have one, just use the bag. Starting on the inside edge of the sliced cake, squeeze concentric circles (one inside the other) to cover the cake. Top with a cake half and press gently to level it. Squeeze another circle of whipped cream along the outside edge of the new cake layer to form a dam. Spread half of the raspberry jam out to the whipped cream. Top with the third cake layer and level. Again, squeeze concentric circles to fill the cake layer. Top with the remaining cake layer and level. Decorate: Remove any whipped cream that may have squeezed out from between the cake layers. Whip the frosting one more time and thinly frost the sides and top of the cake. Refrigerate the remaining frosting and cake for 20 minutes. Cut the tip of a quart ziploc bag about 1/2 inch from the corner. Insert a large closed star tip into the bag and fill with the remaining frosting. Pipe roses onto the top of the cake - see link in the post. Pipe stars in any space in between. Refrigerate the cake until the frosting has hardened before lightly covering in cling wrap. To Serve: Remove the cling film from the cake and allow to come to room temperature for 20 minutes before cutting. The frosting will be soft and the cake still chilled. Serves 12. Total Time: Sugar free jelly - 30 minutes, French buttercream - 30 minutes, Cake 40 minutes, Assembly 30 minutes. 2 - 2 1/2 hours total time. 2.) Skip the raspberry jam and whipped cream. 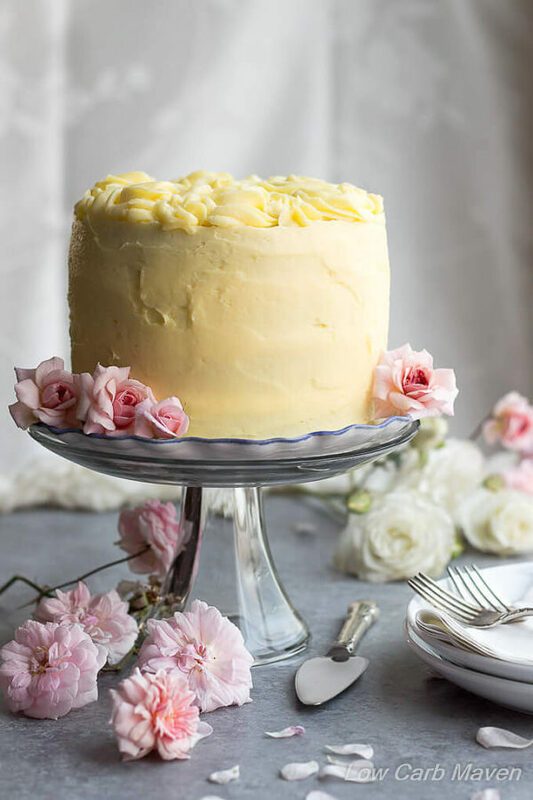 Make a naked cake by filling and topping the cake with the French buttercream frosting and leaving the sides un-frosted. 3.) Use all of the raspberry jelly to fill 2 layers. Skip the whipped cream. Use the French buttercream to fill the middle layer and to frost and decorate the top. My kids and I made this and we were all delighted to celebrate with a great cake! My husband loved it and my 6 year old even wants it for her birthday! That is high praise since our family is from the south and we love baking cakes! Thank you for saving birthdays in my house! Can’t wait to try the others on this blog. Kim, what sweetener has the least gritty texture in your opinion? Lakanto Monk fruit with erythritol or xylitol or a combination? My soon to be 4 year old’s birthday is coming up and I am trying to get the smoothest frosting possible. Thank you! 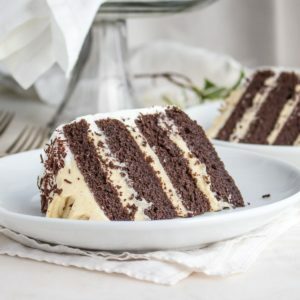 I made this for my husband’s birthday (exactly by the recipe) and it was so incredibly yummy! I loved how the different flavors complimented each other. 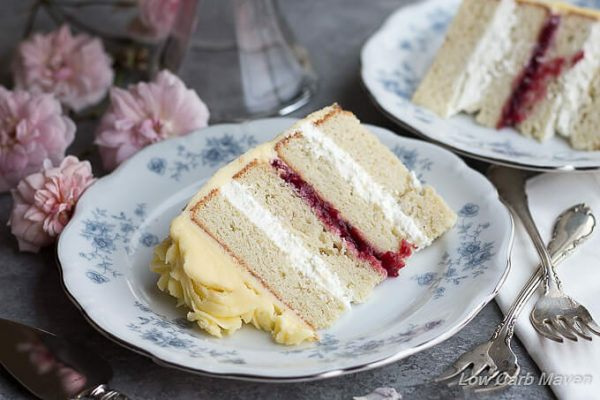 I am going to make this, again, but will try skipping the lemon zest and raspberry and just go with the French Buttercream frosting and whipped cream. Thank you so much for posting this recipe. It is the best low-carb cake I’ve had, yet! So I made this cake for my birthday last week, WOW, DELISH! I didn’t have any raspberries, so made the jam with organic strawberries and it was great! I used Great Lakes gelatin and upped the amount to 1 tsp with success. I also made your pastry cream to fill the other 2 layers (instead of whipped cream). Lastly, I made a chocolate (American) buttercream to frost the cake. Some substitutions I made out of necessity: subbed 2 TB coconut flour for the whey protein powder, subbed 3/4 C homemade full fat yogurt for the buttermilk and eliminated the stevia glycerite since I didn’t have it and don’t care for stevia. The cake was moist and really delicious. Thanks for making my first low carb birthday a huge success!!! Hi! My girlfriend and I love your recipes! I’m trying to make her a cake. Would I be able to omit the whipped cream and use the buttermilk on the inside if I want to use a different frosting so I can decorate the outside? Oh, I was asking if it were possible to use the French buttercream on the inside of the cake instead of the whipped cream filling. Or would that ruin the texture of the inside cake? I made this and it’s absolutely amazing!! The icing actually tastes like buttercream! I made a few changes since I didn’t have a couple ingredients and it still turned out amazing. I only used swerve as a sweetener and I ommited xantham gum ( since I didn’t have it readily available) and it still turned out perfect!! And, the taste?! I can’t convey how delicious this was. I literally ate so much while making that I physically felt ill… went to bed and woke up down another pound this morning! This cake makes enough for your event with some left over for snacks the following few days. Plus, it tastes great as an after work snack; straight from the fridge!! This really hit the spot and killed all cravings!! Will def make again!! Are the cake pan sizes 6×2! Seems small? What would a substitute for the swerve or surkin be? I’m not a fan of erythritol or any product that contains it (or xylitol. I have a dog) but still want to keep it sugar free. This was the first cake I’ve ever made from scratch and the simple instructions were easy to follow! The cake was delicious and was even a hit with party guests that don’t eat gluten free or low carb! A friend has even asked me to make it for her birthday! Total crowd pleaser! What would be some options for the whey protein powder/oat fiber 500? hoping to make this tomorrow for my birthday – can i use vega protein powder as I am dairy free? Hello, Jenn. Happy Birthday. You could try adding 3-4 tbsp more of coconut flour to sub for the protein powder, but I haven’t tested that variation. Several of my older recipes are dairy free as we were a dairy free family at the time. I will link to a few. I found this recipe on Pinterest months ago and decided to give it a try as a possible wedding cake since my fiancé and I are both on keto. It turned out great both times I’ve made it, and I’m currently in the process of baking it for our wedding this Saturday! Thanks for the excellent recipe! Hi, this looks beautiful and I’d like to try making it but wondering how to adapt quantities to make the cake with 9 inch pans? also did you use food coloring in the frosting to make it look yellow like this or did you use lemon? 6 X 2-inch cake pans ? I’m deathly allergic to almond flour. Is there a substitute​I can use? The cake is gorgeous, and I’d love to make it. Thank you. I’m wondering if I can use cashew flour, since it’s flavor neutral? Hi! I was wondering if you think fresh strawberries in the centre with the whipped cream would work? Just so I am understanding this correctly…If I want to make this into a 13×9″ cake I would need to quadruple this recipe? That would be 16 eggs?? Thx so much! Would like to make for my son for his birthday. Happy Birthday, Kim! What a beautiful cake, it looks just perfect! Happy Birthday!!! Mine is Friday and I was going to pass on cake, but not now!! Thank You!! !